SCVNGR “chief ninja” Seth Priebatsch and Gowalla CEO Josh Williams both employ game mechanics to elevate their location-based services, and both believe that gaming’s inherent fun factor can motivate more important behaviors, including social good. But that’s where the similarities stop. 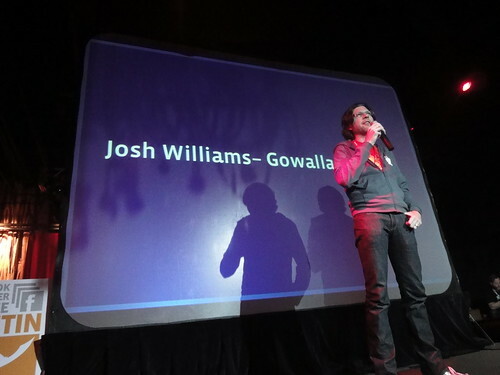 The duo delivered keynote addresses at SxSW Interactive, Priebatsch in front of 4,000, Williams in front of a smaller crowd is his company’s backyard (figuratively — Gowalla is Austin-based). Priebatsch’s thesis essentially reads like this: The construction of the social ecosystem is largely complete; “the framework has been decided.” It’s called Facebook. The next decade will not be about building digital plumbing or social connections, but gaming the established architecture to “traffic social influence.” SCVNGR uses this game dynamic to drive its users to complete location-centric challenges. The 22-year-old, a proud Princeton dropout donning PU-orange shades, proceeded to offer examples of powerful game mechanics in action, as well as broken processes that gamification can remedy. Take Groupon, for instance, as a potent example of the game layer driving customer acquisition. The deal-a-day monster has essentially fused three powerful game mechanics into a $15 billion enterprise equation: “free lunch” + communal gameplay (sharing across decentralized networks) + countdown = the deal is on! Then there’s customer loyalty, where American Express has ingeniously leveraged “level up” game psychology to create status through card colors (gold, platinum, black). SCVNGR clearly drew motivation from this concept with its new LevelUp pilot that combines LBS with Groupon-esque discounts. That purgatory, Williams noted, is the potential not only for check-in overload, but for check-ins and virtual rewards (badges, et al) to be misconstrued as endpoints rather than context wrappers for driving greater utility. Williams’ future for LBS includes narrating personal histories, building and solidifying communities and fostering social good, though he admits that “social validation” will always be a driver (see what enabling photo posting did to mainstream Facebook). Foursquare is the biggest pure-play LBS, with 7.5 million users. SCVNGR and Gowalla each count about 1 million. That’s an intriguing start, but far from a mainstream experience. Neither Priebatsch nor Williams had concrete ideas for how to push forward (at least none that they let on), but this much they certainly agree on: Building bolder value requires delighting users, and that must transcend temporal check-ins. Though no cure-all solutions were put forward, these entrepreneurs’ contrasting outlooks on the future of the converged mobile-social-local universe offered a refreshing reminder that not all location services are created equal…that the space isn’t confined to just Foursquare and a flock of rewards-based followers.